Well “my” play has been switched from Inherit the Wind to Twelfth Night – but i’m sticking with the theme of evolution (genetic scripture) for the show. Show will be at Jericho Arts Centre starting June 29. I’ll probably be finishing work at the eleventh – or twelfth hour – if that’s a segue. As part of the annual Artists in Our Midst on the Westside of Vancouver, I’ve decided to clear out some of my older work – watercolours and acrylic paintings – no (un)reasonable offer refused. Come and check out or email me a bid. You can bid on a particular piece, or bid for your pick – so if you want only one piece but are open to which one. The highest bidder will get first pick and so on down the way. Bidding will be on the pieces in the hallway on May 1 and 2. Bidding will close at 6pm on Sunday, May 2. Successful bidders will be notified by Monday, May 3 and asked to pick up their art by Friday, May 7. Click here to see silent auction items. Or see some of my other work and photos at the Village Vancouver site. 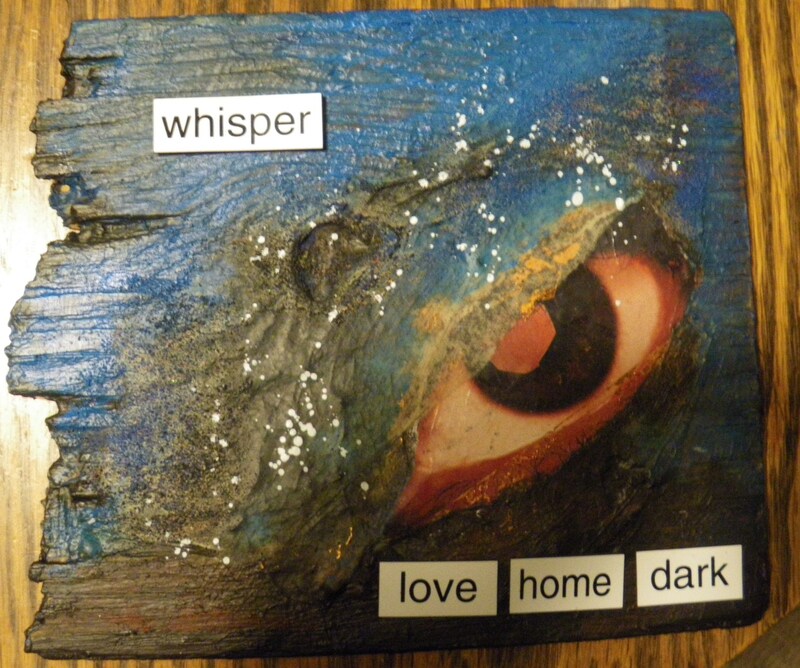 As I explore evolution as a theme for my mixed media art, I learned that the same gene that’s switched on when baby birds learn to sing is switched on when humans learn to talk. When I told a friend this, he asked: So you’re going to do a picture of Darwin going “tweet”? The other way around, I said. 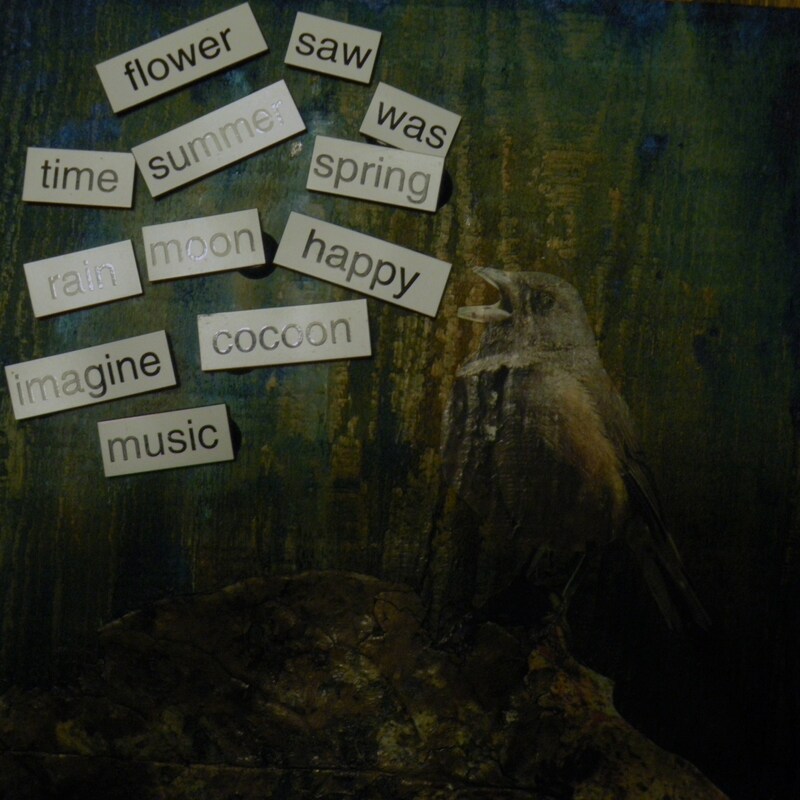 This is something of a prototype – I’m experimenting with other ways to temporarily attach magnetic poetry – such as cutting a speech balloon from magnetic paper, using magnetic paper, rare earth magnets or cut metal. I have in mind that people would feel invited to move the words around. One of those 6 x 2-degrees of separation things, I met Kate Hemenway at a Co-op Housing Educational conference, and then found two very good friends were connected with her, and today realized 2 others. That would be 5, but who’s counting – She’s coming for tea today, and we’ll probably find at least one more connection. We’re both artists currently interested in science and portraying scientific ideas in visual art form. Working on an art project about Darwin/Evolution/Genetics etc. A friend mentioned she’d gone to a lecture about Jung and Darwin – and I shared with her that both had wives named Emma (they didn’t cover that in the lecture she went to.) From what I’ve read the marriages were very different, however. Then I realized that Charles and Carl are, in fact, the same name as well. Carl is a popular given name as well as the name of various places. The most popular male variations are Karl, Charles; the popularity stems from the long lines of historical nobility using these names. Carl, or Karl, is a Scandinavian name originating from old Norse, basically meaning “free man” or just “man”. CARL is a favourite boy’s name in Germany. It has Old German origin. It came from Karl, the German form of Charles. The meaning is “free man”. The boy’s name Charles \ ch(ar)-les\ is pronounced charlz. It is of Old German origin, and its meaning is “free man”. From “karl“, similar to Old English “churl“, meaning “man, serf”. The first Holy Roman Emperor (seventh to eighth century) Charlemagne (Latin Carolus Magnus, meaning “Charles the Great“) was a powerful German leader who created a more ordered society out of the chaos that followed the fall of Rome. He united France and much of central Europe. His widespread fame gave rise to many forms of his name. Charles is the French variant of Carolus or Karolus, adopted by the English especially since the 17th–century reigns of kings Charles I and II. Charles and its variant forms have been favoured by the royalty of several countries, including the present Prince of Wales. Charlie and Charly are occasionally used for girls. See also Arlo. Naturalist Charles Darwin; French president Charles de Gaulle; author Charles Dickens; actor Charlie Chaplin; basketball player Charles Barkley. The girl’s name Emma \e(m)-ma\ is pronounced EM-ah. It is of Old French and Old German origin, and its meaning is “entire, universal“. Originally a short form of German names such as Ermintrude. A royal name in medieval England. Emma Peel was a charcter in the 1960s British TV series “The Avengers”. Literary: title character of the Jane Austen romance novel “Emma”. Actresses Emma Samms, Emma Thompson; singer Emmylou Harris. Emma has 26 variant forms: Em, Ema, Emalinda, Emelina, Emeline, Emelyne, Emmalee, Emmaline, Emmalyn, Emmalynn, Emmalynne, Emme, Emmeleia, Emmeline, Emmelyn, Emmelyne, Emmet, Emmett, Emmette, Emmi, Emmie, Emmot, Emmott, Emmy, Emmye and Ima. I recently heard the term “Stuckism” at a C.G. Jung Society lecture and finally got around to googling. Thereby encountering another new word: Funism. Funism and Stuckism both promote enjoyable and accessible art firmly rooted in our own times, believing that art should be as much fun to look at as it is to think about, and intellectually engaging and challenging without being elitist. A little shocked to do a second google search and see this item appear on Page 2. I was working on a piece representing the idea that the same gene that is switched on when baby birds are learning to sing is the one that’s switched on when humans are learning language. 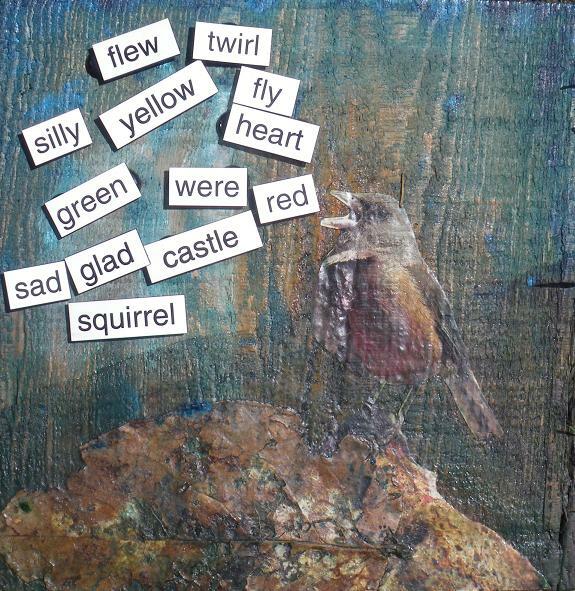 Then I had the idea of having words come from the bird’s mouth – and then I had the idea of having the magnetic words interactive – i.e. mounted on metal. This is a prototype, but I’m rather pleased at how it’s coming along. This is one I started a year ago. I feel it looks either underwater or in outerspace and made me think of Avatar: I see you. I may yet use I see you (or eye sea yew) but for some as yet unknown reason, these 4 words seemed to fit.